It was on the 9th August 1939 that RT1 (EYK 396) entered service with London Transport on route 22 from Chelverton Road, Putney garage. Move forward 75 years to 12th April 2014, and we participate at an event organised by the London Bus Museum to celebrate the 75th anniversary of the introduction of the RT family into service. It also coincided with the 35th anniversary of the withdrawal from service of the last of RTs in 1979. 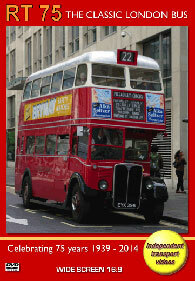 The event, which was staged by the London Bus Museum, used 15 RTs to recreate a section of the 22, which ran from Piccadilly Circus through Homerton to Clapton Circus. A good variety of RTs were used on the day covering every variant of the almost 7,000 strong RT fleet. This included RT1 of 1939, the standard postwar RT with AEC Regent III chassis and bodywork by Cravens, Saunders, Park Royal and Metro-Cammell. Also present were the Leyland variants, being RTLs and RTWs with both Park Royal and Metro-Cammell bodies. There were also the livery variants, from the special scheme worn by RT1 to the prewar and postwar red versions as well as RTs in ‘county area’ green and ‘Green Line’ liveries. The event was centred on the current Arriva garage at Ash Grove. Here a total of 31 RT family members assembled at the beginning of the day. Our filming starts at the busy interchange at Bank where we see the RTs operating in traffic with some of the contemporary vehicles of the day including the ‘New Routemaster’ providing an interesting comparison. Further locations are Cheapside, St Paul’s and Newgate Street where most of the RTs are seen running in service. We then take a ride on board RTW75 (KGK 575) to Ash Grove garage. The atmosphere and engine sounds are most enjoyable as we relive a bygone era. On arrival at Ash Grove we see a number of RTs displayed that were not operating as part of the 22 revival. There were also a number of brand new unregistered ‘New Routemasters’ parked up offering an interesting view of how bus design has changed over the past 75 years! After recording the movements at Ash Grove we board green RT1700 (KYY 527) for a ride back to Cheapside. This time we can hear the AEC engine and pass a number of the RTs in service running in the opposite direction. On alighting from the RT we continue filming at Bank, Cheapside and St Paul’s as the service runs down – the end of a perfect day! The following day our cameras were at the London Bus Museum at Brooklands for their Spring Gathering. Here we see the massive line up of RTs and record the Cavalcade of RTs as they leave the site with the iconic Concorde as a backdrop, and return to the site and park up. Our RT75 Celebration programme is completed with some delightful archive cine film from the camera of renowned transport photographer Alan B. Cross. Filmed in the 1960s we see the RT in action in London including a visit to Aldenham Works, RTs on the famous skidpan at Chiswick Works and some in the early days of preservation. There is further cine film from our own archive. Enjoy the celebrations!